PLEASE NOTE: Compensation for this post was provided by WebSafety. 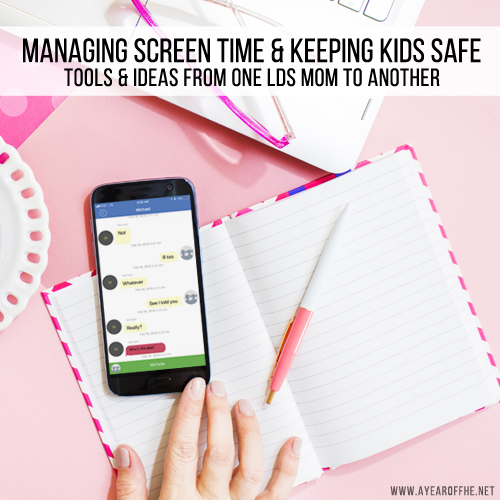 I am sharing this resource with you because I truly believe in this product and use it myself to help my own family stay safe on our smart phones and to limit screen time. This past school year our oldest daughter left the comforts of an Elementary School a few blocks from our house and started attending Junior High three miles from our home. We had not wanted to get her a cell phone until she was at least 14, but suddenly it seemed like it would be a good idea. So, we gave her my husband's old phone, forbade her from joining any social media platforms until she was at least 14, and started the complicated journey of navigating teens and cell phones for the first time. This is a scary world, but we have been told repeatedly by Prophets and Apostles that the Internet and Technology can be a source for great information, spreading our testimonies, and sharing positive messages. But we all know how much bad there is out there! I was overwhelmed and worried that we would make a mistake as we started this journey with our daughter. How can our family take advantage of what is available on the Internet while avoiding objectionable material and people of questionable character? 1. Parental awareness - "Parents need to make online use a family, not a private, activity. Put the computer in a room that the whole family uses, not in a child’s bedroom. Be aware of when and how your child uses [technology]." 2. Family rules - "Family rules about [technology] use are essential. It is important that you and your family members agree on the who, how, when, and what of computer use". 3. Filtering - "You will want to check what is available to your child wherever he or she uses the Internet. If help is needed in addition to filtering, software is available that tracks [usage] and reports to you." I downloaded WebSafety using their 30 DAY FREE TRIAL and it has been so incredibly helpful that I wanted to share it with you. WebSafety is an app to help parents, protect children and help them use their mobile devices safely. It monitors where your kids are going, who they contact and who’s contacting them on their phone. You set up rules and when something that you want to know about happens, you get an alert. WHICH DEVICES CAN USE WebSafety? WebSafety is available on Apple and Android devices, including tablets. There is a free 30 day trial. After the trial it's $5.99/month or $59.99/year. HOW EASY IS WebSafety TO USE? READY TO GIVE WebSafety A TRY?